The men’s basketball team shocked the college basketball world this past Wednesday with a 70-50 win vs. the No. 23 ranked Miami Hurricanes at Bank United Center in Coral Gables, Florida. It was Tech’s first ACC win of the year and the Jackets snapped a seven game losing streak. “We did a lot of good things. It started with our defense. We were so good defensively. We forced tough shots and only thing we didn’t do well in first half was rebound. We maintained our composure. That was the first full 40 minutes we have played. Wish it would have come earlier but it’s a good point to build on and move forward,” said Tech Head Coach Brian Gregory. This the third straight year Tech has knocked off a top 25 team on the road. In 2013 Tech beat Miami who was then ranked No. 6 in Coral Gables and in 2014 Tech knocked off Syracuse at the Carrier Dome who was ranked No. 7 at the time. Marcus Georges-Hunt led the team in scoring once again with 24 points, making this his fourth game this season with 20 or more points. This was possibly the best game of Georges-Hunt’s career as he shot 10 for 12 from the field as he also tallied six rebounds, three assists and three steals. “Marcus was exceptional. Took what the defense gave him. [He] was really good defensively. [We] had a lot of good basketball from a lot of guys,” Gregory said. Another key player during Tech’s victory was senior center Demarco Cox. Cox scored 10 points and recorded seven rebounds and had a thunderous dunk at the end to cap off Tech’s impressive offensive performance. The first half started off fast for Tech, with Tech reaching double digits with less than four minutes played in the game. Tech made seven of its first eight shots and Georges-Hunt made a layup with 14:54 left in first half to give Tech a 15-4 lead. 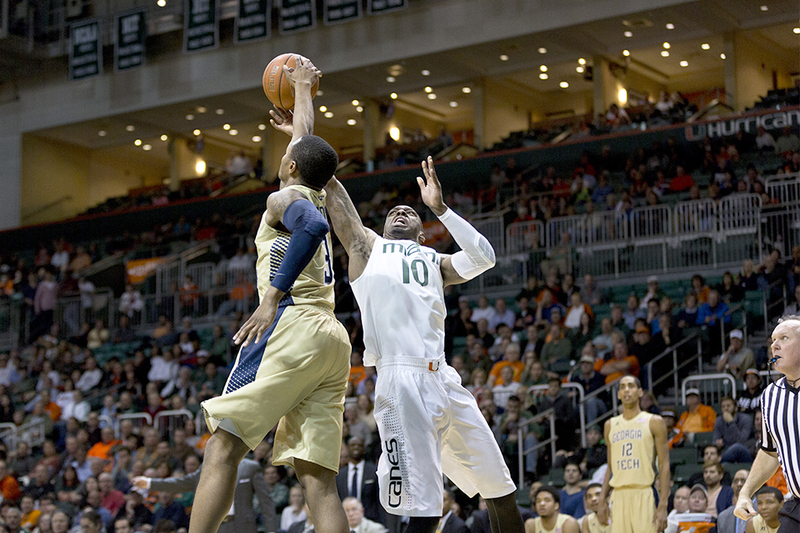 Miami was forced to call an early timeout as the team was struggling to score and defend Tech’s guards. Tech led for the entire game, but Miami seemed to be back in the game after Miami made three three pointers in a row to cut Tech’s lead to 32-26 just before half. Tech took a 34-26 lead into halftime after junior guard Chris Bolden scored his ninth point of the first half just before the one minute mark. Tech’s offense was very effective in the first half, with Tech making an outstanding 57.1 percent of their shots. Both teams looked fresh coming into the second half, Miami tried to get back into the game but for every answer they had, Tech responded. Tech lead by double digits almost the entire second half. Tech saw an opportunity to put Miami away and they did. Cox had two big baskets almost three quarters through the second half to give Tech a commanding 55-43 lead with six minutes left. The final score was 70-50. The Miami players and fans were shocked as Tech celebrated their first conference win. Tech out-played the Hurricanes in almost every aspect of the game, out-rebounding them 32-29 and recorded more blocks, less turnovers and shot better from the field and free throw line. Tech’s point guards freshman Travis Jorgenson and sophomore Josh Heath had their best performance of the year. Coach Gregory praised their performance and said it was the first full 40 minute game the team had played this year. The Jackets were able to secure their first ACC win and Georges-Hunt and Coach Gregory remain optimistic about the team’s future. This victory puts the Jackets at 10-10 overall and 1-7 in conference play. Tech faces off this Saturday vs. NC State and Gregory is hoping for a big crowd.